Forward Turrets of USS California BB-44 in 1938. Note the Range Finders, Range Clock and 0.50" BMGs in gun tubs in front of the conning tower. U.S. Naval Historical Center Photograph # 80528. The Mark 7 was a remanufactured 14"/50 (35.6 cm) Mark 4 with a smaller chamber, a shell centering cone, a single-slope band seat, uniform rifling and a tube locking ring. The Mark 11 was the Mark 7 with the addition of chromium plating to the bore. 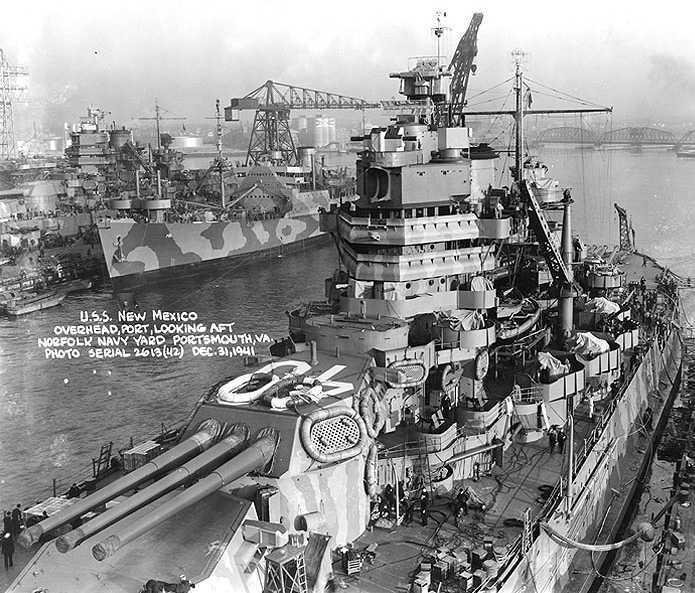 During the battleship modernization program of the 1930s, the 14"/50 (35.6 cm) Mark 11 was used to rearm the New Mexico and Tennessee Class Battleships, although the battleship Tennessee did not receive updated guns until 1942. The problems with dispersion experienced with the 14"/50 (35.6 cm) Mark 4 guns seem to have been corrected with these rebuilt weapons. 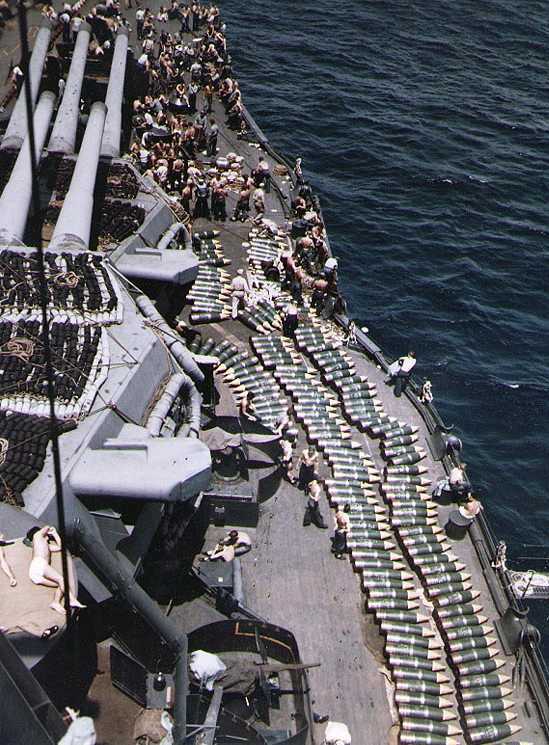 At Surigao Strait, USS Tennessee (BB-43) and USS California (BB-44) reported pattern sizes of 300 to 400 yards (275 to 365 m) for six and nine gun salvos at 20,000 yards (18,300 m), which was not appreciably different than that achieved by the newer battleships during the war. 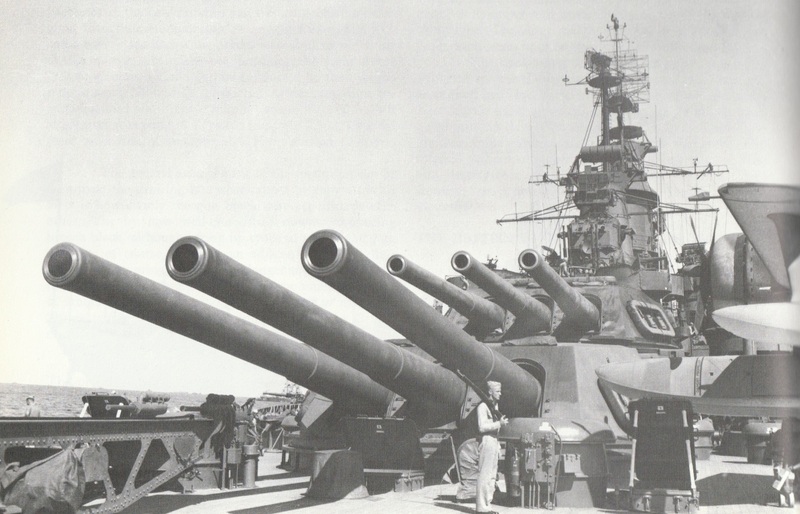 The 14"/50 (35.6 cm) Mark B was the original gun intended for the North Carolina (BB-55) class battleships. This weapon was the most powerful 14" (35.6 cm) gun ever designed by the United States and it was considerably simpler and lighter than the older 14"/50 (35.6 cm) gun. The prototype of this weapon was never completed as its development was abandoned when the 14" (35.6 cm) treaty limit was rescinded in 1937, allowing these new battleships to be armed with 16"/45 (40.6 cm) guns. For this reason, the 14" (35.6 cm) Mark B design was never assigned a standard numerical Mark designation. Nomenclature note: The 14" (35.6 cm) Mark A was the ballistic prototype of all 14" (35.6 cm) guns. This prototype was developed around 1910 from a 13" (33 cm) Mark 2 bored out and relined for the larger projectiles. The finished gun was 33 calibers long. The 14" (35.6 cm) Mark C was a Mark 4 Mod 8 reworked as a prototype for the Mark 11. The data that follows is specifically for the 14"/50 (35.6 cm) Mark 11 Mod 5 unless otherwise noted. On 10 October 1942, USS Idaho (BB-42) was the subject of an unusual test to determine the ability of the older battleships to maintain a rate of fire over a prolonged period. During this test, she fired 100 rounds from each of her six forward guns in 156 salvos. Most of these were fired at a range of 21,000 yards (19,200 m), but the range varied from 19,000 to 28,000 yards (17,370 to 25,600 m) and some salvos were air spotted. The sea state was calm and she maintained a speed of about 15 knots during the test. The test was observed by no less than eight BuShips and four BuOrd observers along with the CinCPAC gunnery officer and eight Army officers from the Western Defense Command. The Navy also used this opportunity to train thirty-five battleship officers in spotting techniques, which probably slowed down the firing cycles. The New Mexico class (BB-40), of which USS Idaho was a member, carried 300 projectiles per turret with 67 of these on the turntable, 185 on the fixed structure of the shell deck, 30 in the lower handling room and 18 in the lower shell circle in the fixed stool structure immediately below the turret shell deck. After the turrets were modified in the 1930s to increase their maximum elevation, these latter shells were difficult to access as they had to be first lowered into the lower handling room before they could be hoisted to the gunroom. 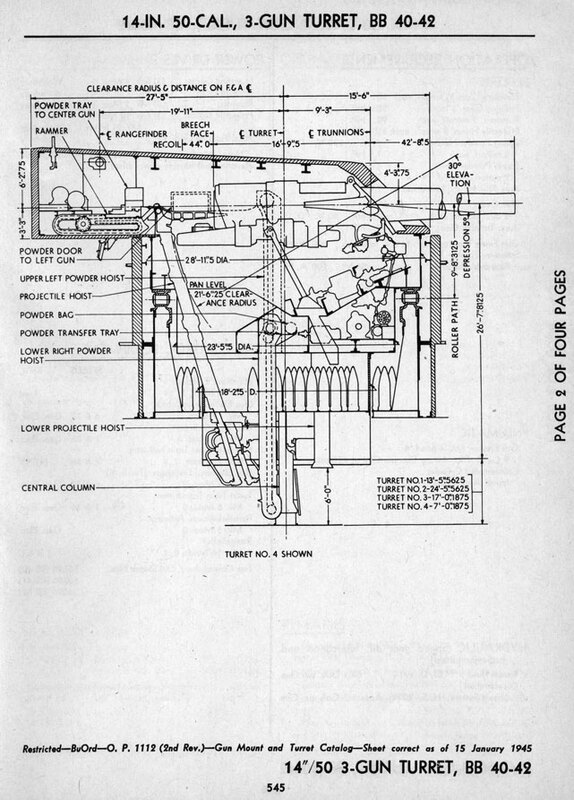 This modification also hampered the propellant supply, with bags being passed by hand into the lower handling room and then taken by hand to the upper handling room where they were transferred into upper hoists discharging into transfer rooms and the loading level, where four bags were sent from each of two hoists to the wing guns and two bags from each hoist to the center gun. 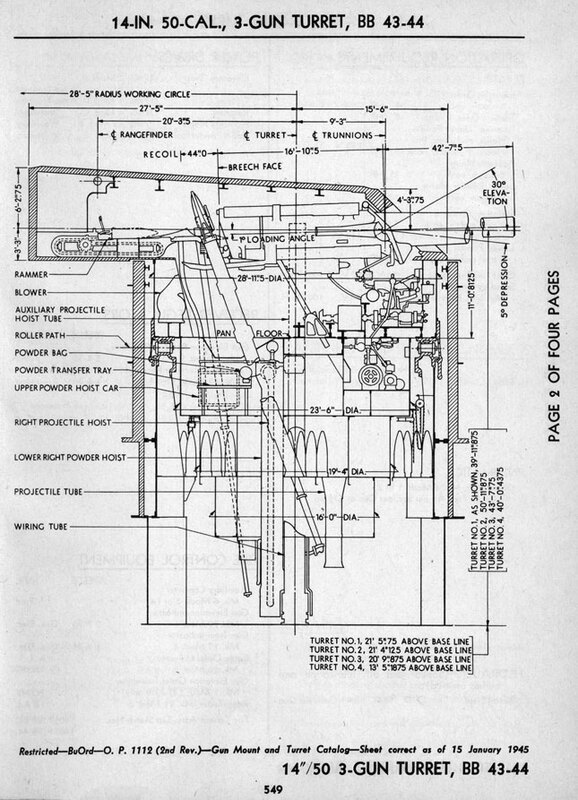 This complex system worked well during the test, even though ammunition supply depended largely upon muscle power. Only five times before the 148th salvo did any gun fail to fire because it lacked powder and only once because a projectile was not available. BuShips commented that "for a good portion of the time, shell and powder handling lines were crossing each other in the lower powder handling room without causing any confusion. In fact, the flexibility of the powder handling system was most impressive, especially with the relatively green crew manning these stations. . . . 2,400 bags of powder were handled without any breakage. Considerable strength and dexterity were exhibited by shell handlers as they 'walked' the projectiles to any desired location by rocking and turning the shells so their points moved in a horizontal circle of about 6 inch diameter. This indicates the importance of acquired skills in any ammunition handling problem." During the 156 salvos fired for the test, only for twenty salvos did all six guns fire together. Forty-seven salvos had five guns. There were twenty-two four gun salvos, thirty-one three gun salvos, twenty-five two gun salvos and eleven 1 gun salvos. The average interval between salvos was 1 minute and 24 seconds. One five gun salvo was fired forty-nine seconds after the last one. Salvos sixty to eighty, which were primarily of five guns, were fired at an average interval of sixty-seven seconds. By the end of the exercise, with both projectiles and propellant having to be transferred from the farthest corners of the shell and powder rooms, salvo firing was delayed and the average interval for salvos 148 to 156 was two minutes. These last salvos were almost all of one gun. Besides the problems of these last salvos with slow supply of ammunition, ammunition supply was considered satisfactory, with only five salvos prior to 148 having any gun failing to fire due to lack of propellant and only one salvo having a gun failing to fire due to lack of projectile. "Guns generally failed to fire for minor reasons: the need to adjust or replace a gas check pad (seventy-eight times); the need to adjust a rammer (seventy-five times); or a misfire (thirteen times)." Based upon this test, BuShips concluded that the magazine arrangements of the old battleships were satisfactory, although it had reservations about the performance of the system in heavy weather. Shortly after this exercise, Idaho entered Puget Sound Navy Yard to be regunned. ^HC Mark 22 was similar to the HC Mark 19 except that the rotating band was about 1.25 inches (3.2 cm) closer to the base. HC projectile bodies could be used with Point Detonating (PD) or Mechanical Time (MT) fuzes. When used with PD fuzes, they were considered to be HC rounds. When used with MT fuzes, they were considered to be AAC rounds. MT fuzes were probably set by hand on the loading trays. ^When the chamber size was reduced during the modernization process, the propellant charge weight was cut by 50 lbs. (22.7 kg). This meant that all 14" (35.6 cm) guns now shared the same charge, which had obvious advantages from a logistical point of view. Even with the smaller charge, the 14"/50 (35.6 cm) gun still enjoyed a higher muzzle velocity and longer range over the shorter guns as well as better armor penetration capability. However, reduced charges were smaller than those for the 14"/45 (35.6 cm) guns, in order to obtain the same muzzle velocity. Bourrelet diameter was 13.977 inches (35.5 cm). This data is from "Battleships: United States Battleships 1935-1992" and is based upon the USN Empirical Armor Penetration formula. ^Unlike earlier USN 14" (35.6 cm) turrets, the guns in these mountings were individually sleeved. ^As built, the New Mexico class had a maximum elevation of +15 degrees. This was increased to +30 degrees during reconstruction in the 1930s. Each turret had a crew of 98 men at this time. The Tennessee class had a maximum elevation of +30 degrees as originally built. 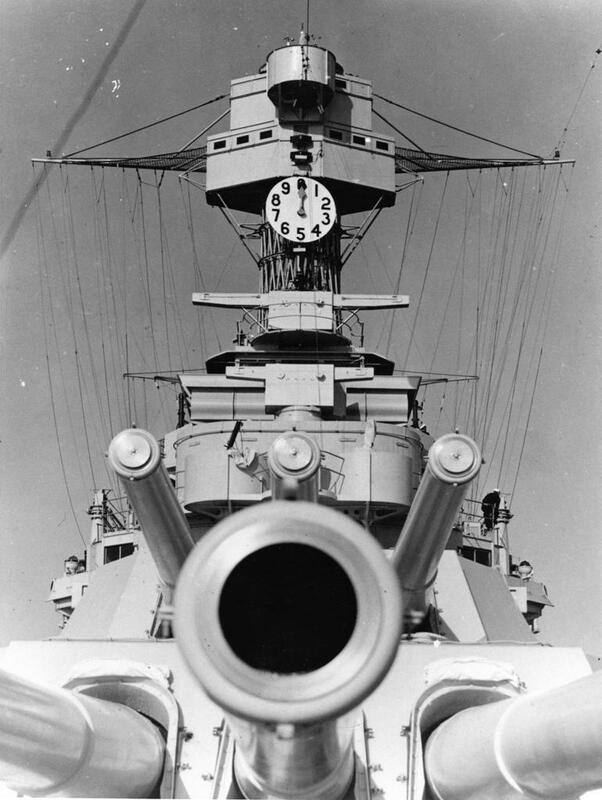 Delay coils were fitted in the early 1930s which delayed the firing of the center gun by about 0.060 seconds (60 milliseconds). These reduced the dispersion pattern by about half. See 14"/50 (35.6 cm) Mark 4 data page for other information about these mountings. USS California BB-44 in 1945. Note the modern fire control equipment and mast-top radar antennas compared to the photograph on the previous page. USN Photograph. USS New Mexico BB-40 in December 1941. Note that the "40" on the turret roof has been painted over the life rafts. Detail from U.S. Naval Historical Center Photograph # 19-N-27362. USS New Mexico BB-40 loading 14" (35.6 cm) HC shells in July 1944. Note turret rangefinders. U.S. Naval Historical Center Photograph # 80-G-K-14228. 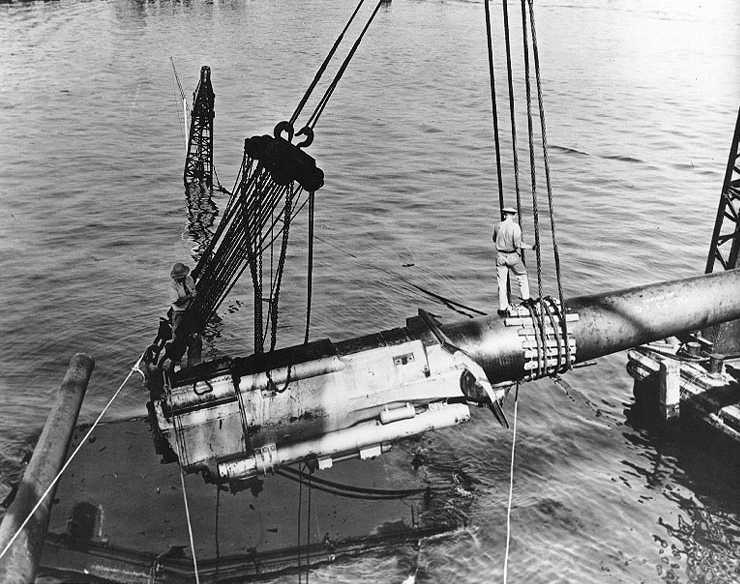 14"/50 (35.6 cm) gun being salvaged from USS California BB-44 ca. February 1942. U.S. Naval Historical Center Photograph # NH 64487. New Mexico (BB-40) class Turret sketch from OP-1112. Image courtesy of HNSA. Tennessee (BB-43) class Turret sketch from OP-1112. Image courtesy of HNSA.